A couple of weeks ago or so we took advantage of a special offer on the Amtrak Capitol Corridor trains where if you buy a ticket, your family or friends can come too for only $5 each way. Since it costs $60 to get to San Francisco these days, which is a lot of money actually, a day out in the city would usually cost me $180 in train tickets alone, but as it was it cost only $80. “Only” $80; I could buy a lot of Lego with that. Well, maybe not a lot, but some. One or two decent sets anyway. The Avengers Tower plus the Ant Man set perhaps. I don’t know, let me think about this actually, I am making my list. Anyway, my wife, my son and I all jumped on the train at 8:25 in the morning and travelled down to San Francisco for a day of just wandering in the city, seeing stuff. It’s such a nice train journey across the Delta and along the Bay, and my son had never been on that journey before. He liked it I think, but he did his best to put on his I’m Bored face everywhere we went in San Francisco. I thought the change of scenery (and cooler weather) would us all some good, but he really wanted to get back to his Lego (tsk, we’re so different). I took him to the Musee Mecanique however, and that was a hit, It’s on Fisherman’s Wharf and is full of old arcade games from the past century, and we had a great time; he particularly liked the skee ball game, while I battled it out as Magneto and Cyclops on “X-Men vs Street Fighter”. Stupid Dhalsim and his long arms, no match for the might of the Master of Magnetism! (Actually I lost). Anyway afterwards we walked down to the water’s edge, to the little sandy beach area at Aquatic Park. 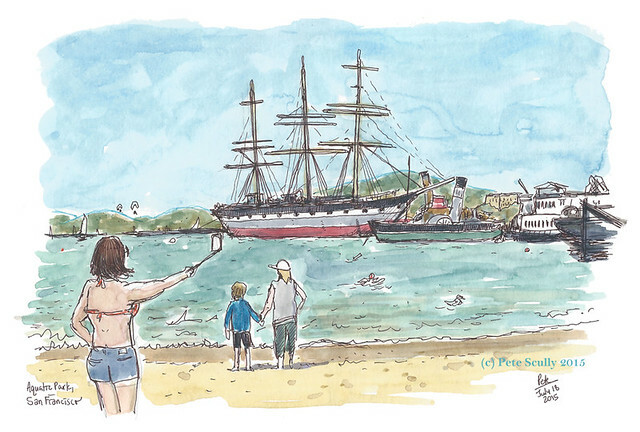 While my son paddled his feet in the water with my wife, I sketched the scene, with the boat SS Balclutha moored on the jetty. I have sketched that ship before. As I sketched, a young woman on the beach was taking selfies, and lots of them. hundreds perhaps. Selfies from above, below, standing, crouched, lying down, facing the boat, facing the bridge, facing the sand, facing the sky, facing the city, every possible iteration of selfie there is (ok not every possible iteration). With the dreaded “Selfie-Stick” of course, bane of everyone’s lives, and if you believe the press, on the verge of being universally banned from existing anywhere ever. She was very happy, and why not, in the sunshine, next to an amazing city backdrop, Golden Gate Bridge free of fog, why not. Passers-by called her the “Selfie Queen”, probably fair, but it made me think of the actual Queen, whose face as we know is on all the money in England, I had visions of Elizabeth II holding up a twenty pound note and looking at it pulling a duck face (can I just point out I don’t know what that is but I hear the term a lot, I don’t care what it is either), and saying “One is taking a Selfie of One’s self,” while Prince Philip is looking at a Selfie-Stick and saying “What the bloody ‘ell is this?” while making some racist comment about tourists. Oh, the Royals. So, I added Selfie Queen (not my term) to the sketch. My wife joked that I should have drawn a selfie of myself with everything in the background, but it would have been hard holding the pen with the book stretched out in front of me, and then the painting, I couldn’t do it. I only did one sketch that day, but I did come back down by myself a week later for the worldwide sketchcrawl (more train money spent). We got ice cream (not Ghirardelli, the lines were too long), and decided against queuing up for more than an hour for the cable car (Saturday afternoon isn’t the best time for that), so headed home. hehe, great sketch….those selfie sticks can be dangerous! I hear Disney World in USA is banning them, but they do help make better selfies if that is your thing! They certainly are. People were apparently using them to take selfies on rides, not smart. I’ve heard of people actually holding them out of car windows to take photos of themselves driving down oceanside highways. I can’t stand the things myself, in a ‘this looks ridiculous’ way, but I guess they do help take better photos than arms-length, or the old asking-random-passer-by-who’s-never-operated-a-camera-before technique. It’s the latest product of our time, the thing that in decades to come will be used to depict people from the 2010s, like when TV shows the 1970s and always include a kid bouncing on a space hopper. Ooh and banana seats on bicycles! That sounds like a grand day out. I haven’t been to SF since 2000. I would love to go back and show it to my kids. Great city. Man, those train tickets are expensive. It’s like they want to stop people traveling. Oh yes, well my son calculates time in terms of lengths of Ninjago episodes. Ha! I remember doing that with Playschool episodes: “How many Playschools will it take, Mum?” For a while my kids were measuring things in “Adventure Times”. Playschool? With Floella Benjamin and “Let’s Look Through the Round Window” and Humpty and Jemima, that one? Wow that brings me back. I watched that a lot when I was a kid. I remember when they replaced Hamble the doll. Yes indeed. Glad I could bring back memories. *buy not but. Stupid autocorrect and stupid stubby fingers.